It’s July 3, 2014, six days short of my 89th birthday. I am not going to see tomorrow. My name is Thresa Pilipovich. I was born to John and Maria LaVella. I am the last of the 14 children living. I lived on Limerick Hill in Herminie, PA until I married George in 1948. We moved to Rancho Cordova, CA in 1962. I was a devoted mother and freely shared my family’s joys and sorrows. I was in awe of my grandsons Joseph, Jamin and Nicholas, who brought so much joy to my life. I loved babies! I had five. I could not walk through a grocery store or mall without oohing and aahing over every infant I saw. I took pride in myself, my home, my friendships and most of all George, my husband of 68 years, to whom I am lovingly grateful. I cared for him as I watched him work long hours to provide for his family. Isn’t life interesting that he should be the one caring for me these past 8 year as I struggled with dementia! At age 87 he underwent open heart surgery with words to his doctor expressing his need to stay in this world and care for me as long as he could. And he did so with love, devotion, humor, and determination. Fortunately, back in the day, my daughters brought many people to our home. I enjoyed every moment with those boys and girls - their laughter and drama. I had one rule -- no boys past the hallway bathroom! I am proud of all I accom-plished in my life. I came from humble beginnings in a Iarge, Italian family. I worked hard from a young age. When I was 14, my mother took sick, and I had to drop out of school to care for my father and 5 brothers. I was a glass blower and a nurse’s aid. I ran away from home and worked at a military base in Arizona during WW II. I found the courage to begin driving at 45 and obtain my high school diploma at age 60, and was asked to deliver a commencement speech. I even took some college courses. I was an activist against Rancho Seco and a campaigner for Bill Clinton. In twenty-two years in the Folsom Cordova School District, I achieved the title of Cafeteria Manager and was fortunate to meet and enjoy so many kids in Rancho Cordova. Collecting my retirement check was really gratifying. Over the years I was an avid reader and loved to learn new words. 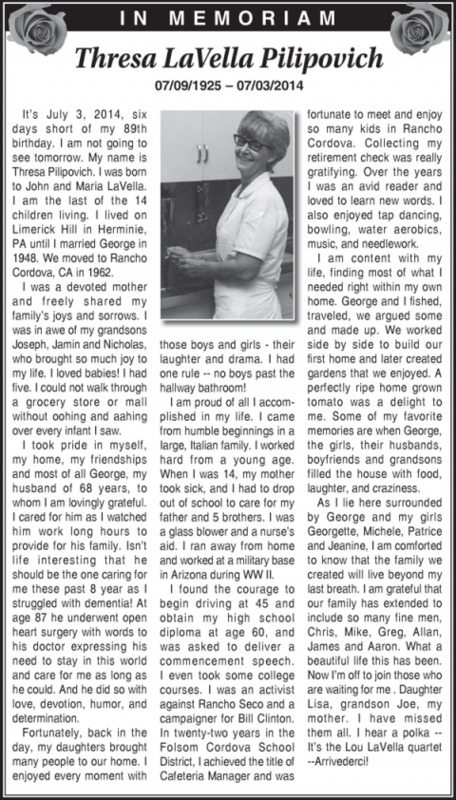 I also enjoyed tap dancing, bowling, water aerobics, music, and needlework. I am content with my life, finding most of what I needed right within my own home. George and I fished, traveled, we argued some and made up. We worked side by side to build our first home and later created gardens that we enjoyed. A perfectly ripe home grown tomato was a delight to me. Some of my favorite memories are when George, the girls, their husbands, boyfriends and grandsons filled the house with food, laughter, and craziness. As I lie here surrounded by George and my girls Georgette, Michele, Patrice and Jeanine, I am comforted to know that the family we created will live beyond my last breath. I am grateful that our family has extended to include so many fine men, Chris, Mike, Greg, Allan, James and Aaron. What a beautiful life this has been. Now I’m off to join those who are waiting for me. Daughter Lisa, grandson Joe, my mother. I have missed them all. I hear a polka -- It’s the Lou LaVella quartet --Arrivederci!